Those of you who followed this blog during my year of reading the world in 2012 may remember the difficulty I had choosing a book to read from India. With such a wealth of stories available from this nation of 1.2 billion people, it seemed impossible to find a way to select just one for my project. Luckily for me, the dilemma was solved when Indian writer Suneetha Balakrishnan stopped by the blog and observed that all the recommendations I’d had were for books written in English, and that there was a huge amount of even better literature written her nation’s 22 other official languages – not to mention the many unofficial tongues also spoken there. On the strength of Suneetha’s comments, I chose a book by one of her favourite authors, MT Vasudevan Nair, who writes in Malayalam. As you can see from the post I wrote at the time, it proved to be a great decision. All the same, I remember being frustrated that I couldn’t explore more Indian literature in translation during that year. It seemed that there was a rich variety of amazing stories that we English-language speakers rarely if ever hear about. So I was delighted to hear from Suneetha this summer that she has been blogging for women’s writing magazine Mslexia about Indian literature written in languages other than English. In celebration of this (and because I enjoyed her previous recommendation so much), I decided to feature one of the novels she has reviewed as my September Book of the month. 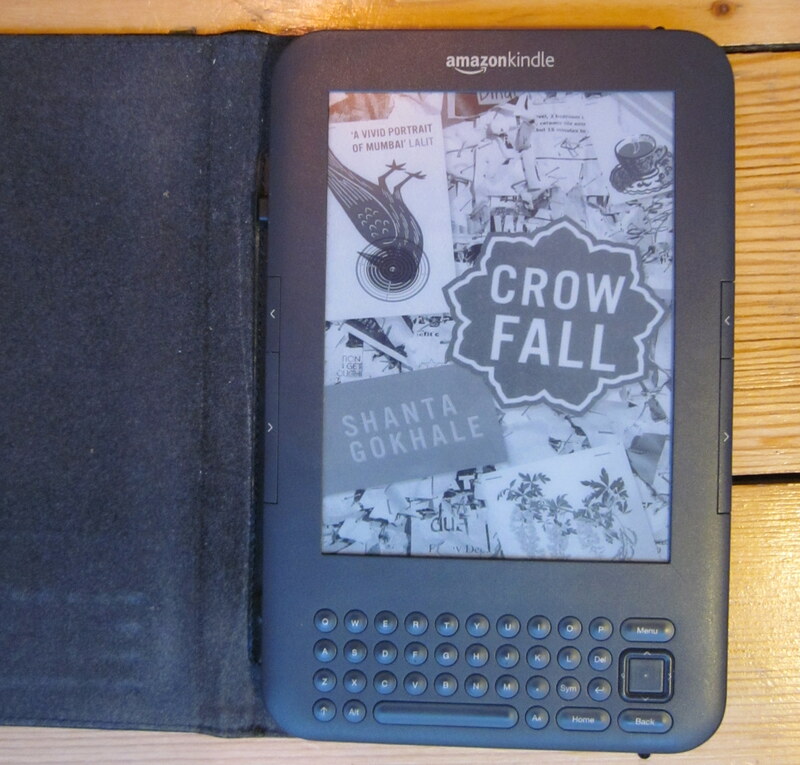 I plumped for Crowfall by Shanta Gokhale. This was partly because of Suneetha’s enthusiasm for the book, which you can read about on her post, and partly because I was intrigued by the process the novel went through to get into my hands. Not only did Ghokale write the original version in Marathi, she also translated it into English herself. I was intrigued to see how it had turned out. Crowfall is a big and ambitious book. It weaves together the experiences of three painters, a musician, a journalist, a teacher and the widowed mother of two of them in Mumbai. Recording their struggles as they attempt to define their careers, themselves and one another – and overcome their grief at a series of untimely deaths and a loved one’s disappearance – it uses individual lives as a prism through which to look at large questions of identity, prejudice, the caste system and what we mean when we talk about art. Though the premise might be tricky to unpick, the language certainly isn’t. Gokhale has worked as a translator during her career and her facility with words shines through in the beautiful clarity of her sentences. Time and again, succinct phrases capture complex ideas and emotions. From writing about the experience of being crushed between passengers on a bus ‘like chutney in a sandwich’ and describing an extreme method for dealing with Eve-teasing, to a skilful elucidation of the way performances based on raags (melodic modes) work in Hindustani music, Gokhale brings us along with her, by dint of her clear, compelling voice. Creative ideas are like that. You don’t plead with them to come. You pretend you can live happily without them. Then they steal upon you like thieves. Just be alert to grab them by the hair. Gokhale’s portrayals of the experience of consuming art (as well as the platefuls of delicious-sounding food served throughout the book) are similarly eloquent – no mean feat, as many writers fail miserably when faced with conjuring up what it is like to look at a colourful, urgent painting in flat, grey words. With such a large cast of central characters and numerous peripheral figures, the book can be confusing at times. This isn’t helped by Gokhale’s decision to leave considerable amounts of dialogue unattributed, so that you can find yourself confronted with long stretches of sentences in speech marks, wondering who said what. In addition, the numerous philosophical discussions – though skilfully rendered – slow the narrative down. There are times when you get the sense that Gokhale is much more interested in evoking experiences and exploring ideas than telling a story. For all that, though, this is a marvellous read. As intricate as a performance of a raag, it intertwines experiences, lives and cultural specificities to create a powerful and thought-provoking – if sometimes dissonant – whole. Once again, like MT’s work, it provides a tantalising taste of the banquet Indian writers working in languages other than English have prepared. I’ve been looking for books translated from Marathi! I’ll definitely have to track down a copy of this one. Oh good – hope you like it! I’m going to read this! Thanks! L.